We’re looking to make our community as resourceful as possible for our current and future members! We plan to implement a few changes around here, so don’t be alarmed when things start to look a little different. For starters, we’re updating all of the categories and topics. We want to make sure that answers, tips, and advice are easy to find. Categories will now be much easier to navigate and search. 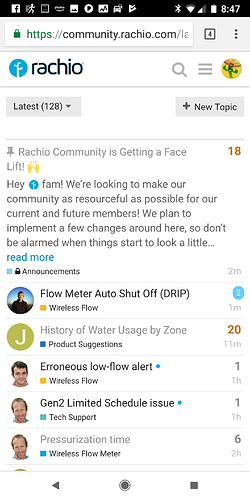 Plus, it will eventually match our Help Center, so getting help across Rachio platforms is simple. We’ll release the new categories as a reply to this thread once we’re live with the reorg. Confused about where your topic should go or have a suggestion for a category that needs to be added? DM me! Categories and current thread organization will be updated by July 1. Next, we’ll be updating the layout! Categories will be listed on the left and recent topics will be listed on the right. This will allow users to easily search for answers by selecting the category and subcategory rather than searching through a ton of keywords. Layout will be updated by July 1. In addition to organizing all of this, we’ll be creating a few “clusters” to help direct to the best threads on the community. 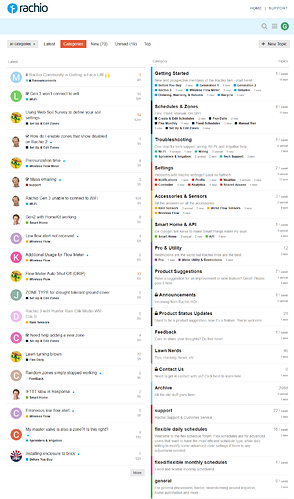 Think of this as a “table of contents” for the community. These threads will host links to threads with the most accurate and helpful information on certain topics. Feel free to engage with these and shoot us suggestions on the best threads to help provide more value to new users learning about irrigation and Rachio. These will be created and updated throughout July. We’ll also be updating some thread titles in order to better direct users to the answers they seek and cut down on search time. We plan to publish the thread’s original title in the top of the original post so it’s still searchable by the keywords you’re used to. These will be created and updated throughout July and beyond. 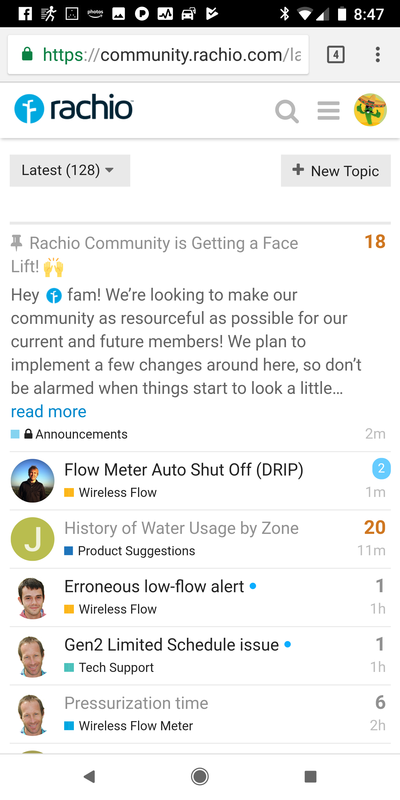 Last but not least, you’ll be seeing more engagement from the team at Rachio! All of us at Rachio HQ will be here to help with questions and get you answers faster and more clearly. We are so grateful for your support and dedication to Rachio. We hope these changes will make your experience in our community even better and we’re excited to grow with you as we continue to innovate. All hail @laura.bauman, the Rachio community queen! Couldn’t have done it without help from @mckynzee, @franz, @emil, @chris, @nicktart, @sarachio, and YOU! GO TEAM! Great plan. Hope the interface on mobile is as pleasant as this one is right now (I like the small letters and dense navigation). I have seen most active forums move towards tags. Advantage of that is, that you will be able to convert them to categories once they turn out to be heavily used. On same token, suggested tags that don’t stick, wont change your structure. A limit on tags per topic forms the boundary in most cases. Also, great thoughts on the tags! I’ll have to look into that a little more to see the best way for us to use that feature. Have any forums in mind I could take a look at for some inspo? “#hashtags” like twitter. most people know twitter. very useful for structured searching. Anyone else receiving a ton of email from Franz starting at 1:45PM, still continuing. Seems every announcement every made? Just an idea, but I feel like the “Latest” column would be better off on the left of the new home screen where Category column is now. This would help with the transition since at the first glance the left side of the home screen would look similar to how it used to. As is I now need to skip the categories, during the natural left to right reading order, in order to get to the latest posts. I like that idea @Gene! I admit even I was getting stuck the first few times I looked at the homepage after transitioning. Creating a poll below - will close at midnight tonight and then make the change (or not) tomorrow. VOTE AWAY! Which homepage layout would you prefer? Great question @Dwiniger! You should be able to just go into Edit Schedule, under Times, and select “start at a specific time.” Let me know if you run into snags! Ok. So i can have just that one day start at unique. time? 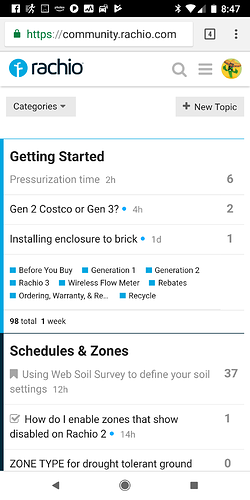 Any way to change my landing page on the mobile app to “Latest”? 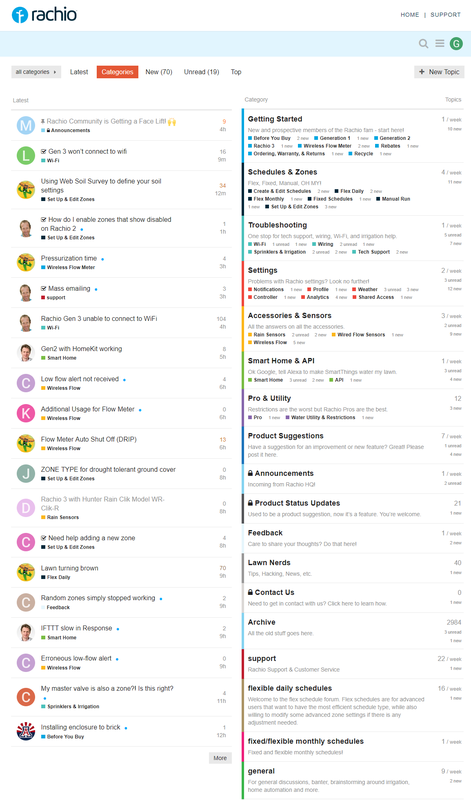 The categories take up a fair amount more space on mobile than the desktop, for obvious reasons. @azdavidr We’re considering changing the layout so that “latest” is on the left and “categories” are on the right. On my phone (Samsung 8) that would solve your issue. Would that work for you as well? Also, taking a poll above ^ regarding layout! This seems different than what you see?